Smithellaneous: The Week in Review. Sort of. Oh wait, I can't review a week that hasn't happened yet, can I? So. On to the "Review." First of all, because I by no means wish to suffer alone, I will take this opportunity to remind you all of my trip tomorrow to Chapel Hill for a visit with yet another Scary Doctor. This is the doctor who is planning on sticking a camera AND a strobe light up my nose and down my throat. Why is that I'm not feeling very excited about that? It will be at least three hours round trip, plus the visit itself so Steve and I will be gone most of the day. However, since I'll be happily full of my relaxing medicine, the whole day will probably just zoom by and I'll just be a perpetually happy camper throughout. Or, on the other hand, maybe the happy medicine won't do its job and I will end up throwing up all over the Scary Doctor. One never knows. Stay tuned for this exciting breaking news. On Wednesday, I get to go back to my dermatologist to have the mole on my chest "re-excised." Or whatever it is they do when they remove it the first time and still don't have clear margins. So I'm looking forward to cameras up my nose on Tuesday and sharp objects and stitches applies to my person on Wednesday. Do I know how to have fun, or what? 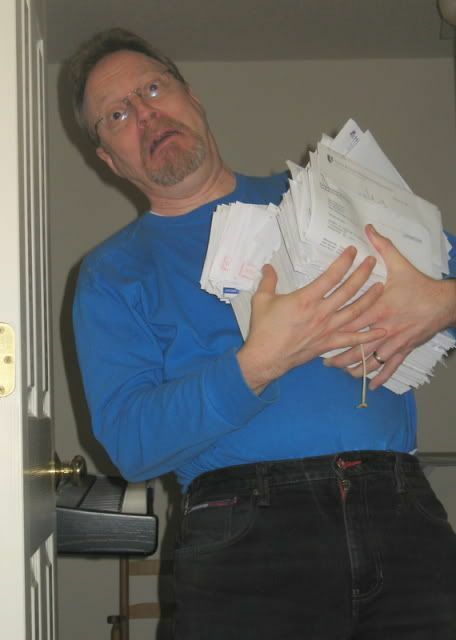 And speaking of fun, here is Steve staggering under the weight of a pile of insurance statements for Sarah and me from the last several years. We're just trying to do our little part to keep the North Carolinian medical industry healthy. This Friday, Make-A-Wish has invited its families to the Blue Angels Air Show dress rehearsal. Sarah isn't going to go this time around because she'd have to miss school; also, the last time she went, all the noise from the planes was very distressing to her. But you can bet Steve and Nathan will be there with bells on. And I might even go too; it just depends on whether or not I feel like another outing after the aforementioned "camera up the nose, sharp objects applied to body" outings. And so there you have it. The Week in Review. Sort of. Now let me do a "Last Night In Review." Last night, we had our family portraits done. Snowy even went along and behaved himself rather stunningly. The portraits were provided through an organization called, "The Littlest Heroes Project." This organization provides free family portrait sessions for cancer families by utilizing the talents of professional photographers from around the country who volunteer their time and services. Last night we were paired with Amy from Serenity Photography in Raleigh; she and her colleague, Pam, were delightful to work with. Since (between the two of them) they took about 800 photos, we should definitely get something we like! I'll be posting some of the pictures in the next week or so. And now I'll go ahead and close with all the exciting breaking news concerning the sale of our house, Steve's new pastoral position, and our move to a new town. Oh wait. There is no breaking news. Oh dear... I don't even know the Big Scary Doctor and I don't like him. Throwing up on him would be an interesting statement; he would certainly never forget you after that. But I hope the medicine just does it's job. And more mole excavations? Yuck; the least they could do is to come out of there with a diamond or something. Blue Angels=FUN for the boys.. but I wish MAW would hook you up with something that would be really fun for you and Sarah, like a writer's conference, or a fashion show..or.. ohhhh, a CHOCOLATE festival!!!! :<) (a trip to Hershey, PA?? or better yet, Switzerland!). Can't wait to see the pics that you get from the pros, although yours are pretty darn professional. Finally, I'm praying that your "week in preview" doesn't have all of the pieces in place yet, and that the missing ones are the very things that you mentioned at the end. Your week sounds as exciting as some of mine! By the way, I like the new font...Good for these old eyes!! Ok, Becky, let's rethink this scary doctor thing, okay? First of all, we will all pray that he will allow God to work through him on your behalf. Second, we will pray that the happy medicine not only does its job, but makes STEVE happy as well. And, lastly, some reality to add to the picture. . . It's a teeny, tiny camera and light, Becky. Were you expecting a 35mm with wide angle lens, or what? You will be fine! WE know it, now YOU just have to get it. And, of course, vomiting afterward for effect would be an interesting twist...but just if you really really want to. First, let me share with you that the camera, scope thing down the nose is not that bad. They spray something in the nose to numb it. Hope all comes out okay for you with that. You sure have your week planned out for you. I would say enjoy but that would be cruel. But you can enjoy the Angels if you go...I have not been since I was a small child..